As entrepreneurs maintain a primary focus on running a successful business, proactive planning understandably gives way to the demands of the day. Unfortunately, the failure to proactively plan in the following areas can have catastrophic consequences for the entrepreneur. While the APS™ is not meant to be an A-Z educator on domestic, offshore and “global” asset protection planning, this site does contain a lot of good information for the public and advisors to learn the basics of AP planning. We also understand that not everyone wants to read a 10-20-30 page technical dissertation on every topic and instead would like to read brief articles on multiple topics. Because the APS™ believes that asset protection is a “global” concept (meaning we believe you should protect your money against ALL creditors including the IRS, downturns in the stock market, long-term care expenses, etc. ), we have listed below several different areas of interest where informative articles are posted in the appropriate section. Simply click on the topic of interest and a list of articles for your reading pleasure will be accessible. Protection from “Other” creditors (long-term care costs, health insurance costs etc). If you have any questions about the posted articles, please seek out a locally “Rated” advisor or contact the APS™ at Email Us or complete this form below. 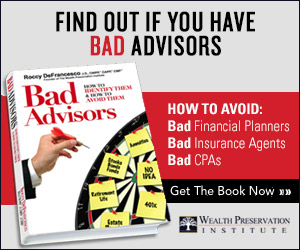 If you are a “Rated” advisor and would like to have an article reviewed for possible posting, please submit the article to Email Us.